Daily - Departure times depend on the time of year and vary between 4pm and 7.30pm. Spring and Summer provide the most spectacular of Sunsets. We are comparing Ria Formosa Islands Sunset Catamaran Cruise From Faro Prices from leading ticket suppliers and Try to find you Cheap tickets prices on the market. Ria Formosa natural park is made up of barrier islands on a lagoon system - A beautiful natural setting ideal for watching the sun disappear into the sea as another beautiful day comes to an end. You can never tell what stunning show the sky is going to produce on any given night or with what colour pallete you'll get to experience but you're sure to feel that you've found a piece of paradise here no matter what; Ria Formosa sunsets being as beautiful and breathtaking as those in Santorini, Venice and other iconic locations around the world. A must-do trip for those who appreciate sunsets and our beautiful natural world. A fantastic opportunity for photographers to get a front-row seat as the sun sets into the water. With group sizes limited to 12 it can be an intimate and romantic experience. Your Experience With Ria Formosa Islands Sunset Catamaran Cruise From Faro? Depart from Faro marina on a relaxing 1 hour catamaran boat trip across to the lagoon at Ria Formosa Natural Park taking in some of the beautiful views of the barrier islands on the way. From your seat in the boat you will get the best view of the sun setting over the calm sparkling waters of the Algarve. Just sit back, relax, and watch the beauty of the sunset unfold in front of you as you forget all about the worries and stresses of everyday life. Take some photos of the sun disappearing into the water to remember this moment forever and listen to the English speaking guide as he gives you some information about the area. Once the natural spectacle is over you'll sail back to Faro port. What Ria Formosa Islands Sunset Catamaran Cruise From Faro Includes? A 1 hour boat trip by catamaran to see the sunset at Ria Formosa Natural Park with return to Faro marina. A safety briefing takes place before departure to ensure everyone knows the safety procedures. Your skipper will provide some commentary on the journey, explaining a little about the lagoon and the barrier islands that form the natural park. Watch the sun sink into the sea in a sunset spectacle. Enjoy commentary from an English speaking guide. Take a sweater or jacket, the sea breeze is chilly once the sun goes down! Travelers Reviews about Ria Formosa Islands Sunset Catamaran Cruise From Faro? 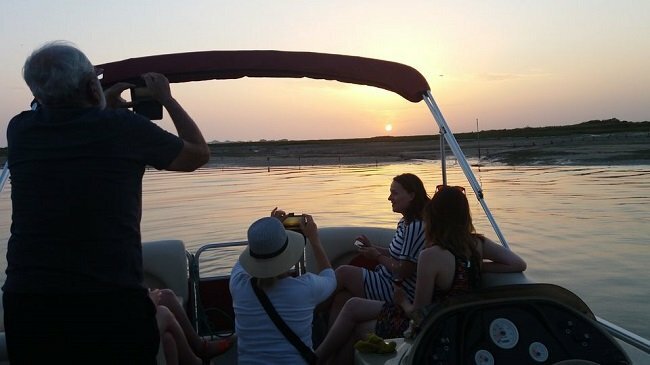 Travellers talking about this trip on Tripadvisor and GetYourGuide are thrilled with the sunset cruise and highly recommend it to other travellers, keen to do the trip again themselves. It has been described as 'A Fantastic Experience', 'Amazing', 'A Beautiful Sunset', and 'Absolutely Perfect'. Printed tickets and electronic tickets are both accepted. Arrive at the boat 15 minutes before departure. There is free parking at Largo Sao Francisco if you are arriving at the marina by car. You are allowed to take your own drinks and snacks on board so buy a bottle of wine (don't forget the glasses) or a beer and crack them open at the sun goes down. Faro Port - Check your booking confirmation for directions.